There is a place, in Boston, where people gather everyday and say Yes God. It is called the Yawkey Family Inn. This home was built on compassion, it is run on compassion…it is a place where people say “Yes God” every day. It is a place where I was humbled. It is a place where faith is renewed and strengthened. And, it is a place where travelers can share with one another their fears and their hopes. I stayed at the Yawkey Family Inn because my eleven week old granddaughter was undergoing open heart surgery at Boston Children’s Hospital. Here I met women such as Amy and Karen, who have been frequent visitors to the Inn…not by choice, but by necessity. Here I was greeted with warm cookies late at night and homemade meals provided by volunteers; this was a place where people shared their stories, their fears, and their emotions with people who understood. One of the first people I met was Karen. She talked about the goodness of God and how we are all called to say “Yes God”. Opening up her computer she played sermons she had bookmarked where the pastor was extolling the virtues of giving into God’s plan…not our plan, but His plan. In spite of everything she is enduring, the love she felt for God radiated from her. 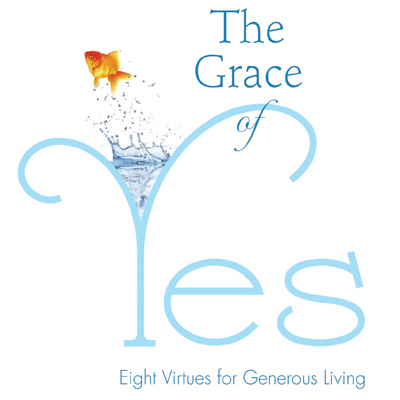 How prophetic that I met her a week before the Grace of Yes Day! There are moments in life when we all want to cry out”Are you kidding me Lord?”. On this Grace of Yes Day though I will remember people such as those who helped me during a very difficult time, who sat on a basement floor with me while I poured out my worries and fears, who reminded me of the blessings that come our way when we just say “Yes God, Your will be done”. Have a beautiful grace-filled day.